Sun, Jul 16, 2017, 09:07 pm SL Time, ColomboPage News Desk, Sri Lanka. 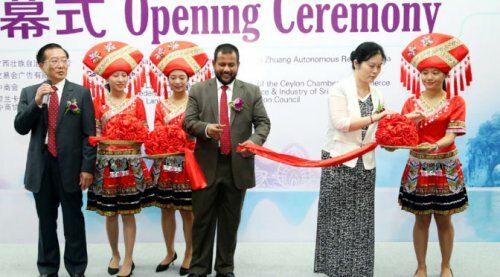 July 16, Colombo: Talks between Sri Lanka and China in pursuit of the coveted Free Trade Agreement (FTA) between the two countries are progressing smoothly and six exhaustive sessions of official talks have been wrapped to-date Minister of Industry and Commerce of Sri Lanka Rishad Bathiudeen says. "Our talks with China are progressing smoothly, the sixth round of talks were successfully concluded in March in Beijing. We are working for the seventh FTA round next," said the Minister addressing the launch of the China Guangxi Products Expo in Colombo on Friday. For the first time the Department of Commerce of Guangxi Zhuang Autonomous Region is holding the "2017 China Guangxi Products Exhibition (Sri Lanka)" in Colombo at the Sri Lanka Exhibition and Convention Centre (SLECC) from July 14-16. Deputy Director General of Department of Commerce of Guangxi, Xiong Jiajun and a 40-man strong trade and exhibition delegation of which 35 were event exhibitors from Guangxi are attending the expo. "In recent years, China-Sri Lanka two way trade has grown faster than our trade with many other countries. Last year China became the largest import origin for us. 42% of our total imports from the world in 2016 came from China at a value of $ 4.2 billion. The result was that China is now the largest global supplier to Sri Lanka," said Minister Bathiudeen. According to the Sri Lanka Department of Commerce under Minister Bathiudeen, Sri Lanka's top exports to China last year were Ceylon Tea, coconut, footwear parts, apparel, and rubber tires. Sri Lanka's largest export to China five years ago was 'various types of fibers' immediately followed by Ceylon Tea, but by last year, Ceylon Tea has crowned the exports list to be followed by 'fibers'. Though Lankan exports declined somewhat in 2016 to $199 million from 2015 high of $293 million, in general, exports to China have been on an upward trend-surging more than 5 fold (568%) since 2007's mere $35 million. Top imports from China last year were mobile phones, boats & vessels, handmade fabrics, and petroleum. Mobile phones remained as the largest import item from China to Sri Lanka during the last five year period. Minister Bathiudeen noting that recently IMF and World Bank ranked China as the world's largest economy based on Purchasing Power Parity said a FTA with such an economy would be beneficial for Sri Lanka. The exhaustive negotiations on the FTA by the Sri Lankan side, shouldered by the Department of Commerce, always move ahead after continued domestic stakeholder consultations and feedbacks are received, the Minister said. According to the Department of Commerce, in 2016 Sri Lanka's total bilateral trade with China was $ 4.4 billion, a huge 363% increase in comparison to a decade back in 2007 (at $965 million), and even an 11% annual YoY increase in 2016 -from 2015's $ 4 Bn.